It’s cliche to say that teachers aren’t appreciated. It’s barely worth mentioning that teachers promise to keep students safe, undergo thousands of hours of training, and manage hundreds of students each day – both educationally and physically. But, as requirements to be a good teacher escalate every year, administrative support and investment to hire excellent teachers isn’t rising to the occasion. Did you know that a good teacher would have to work twice as many hours to earn half as much pay as a part-time, online copywriter? I didn’t, until yesterday. That’s when I realized that the system is literally making it impossible for me to justify being a teacher. The current U.S. education system is destroying the will of teachers, for no other reason that pure mismanagement and lack of respect for the profession. It’s the ultimate case of destruction for destruction’s sake – making “teacher pay” the ultimate deplorable word. You might think I’m being dramatic, but, trust me, I’m not. The education system has been spiraling out of control for 50 years, with each new administration sure they know how to fix the problem. Unfortunately, we’re looking at systemic issues that can’t be addressed with a standards-based testing program or bigger administration budgets. Teacher pay is one of the biggest reasons schools are failing today. As teachers, we are inculcated to believe that “no one goes into teaching for the money.” The mere thought is a violation of the erudite ideals that no financial gain is worth the accomplishment of shaping future generations. 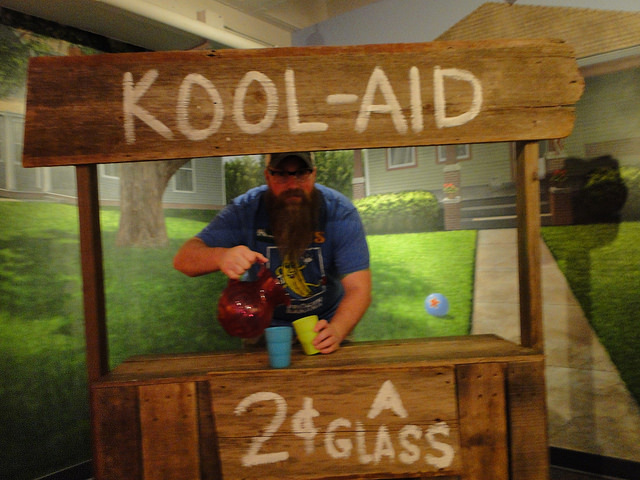 We’ve been drinking the purple Kool-aid, people. No, we don’t get into teaching for the money. We go into it to help people. To change the world. And yet, it’s clear that we are being taken advantage of. There are people who bank on the fact that new teachers will eat the poison of low-payment and high-debt because of the philanthropic natures that have led them into the field. I know that, as a Language Arts teacher, it will take me approximately 19 years to pay off my $30,000 in student loans on my teaching salary alone. I know Superintendents and District Administrators who make almost $200,000 per year. I know technology specialists who are sinking $60,000 – $100,000 into new computer labs, software programs, and student film studios. I know teachers who say, “I’m retiring in two years. I hate teaching but I’m just waiting it out,” who will make over $50,000 per year for the rest of their life. I know principals who spend $100,000 per year on teacher training, new program materials, and behavioral systems, but who can’t take the time to give feedback to new teachers. As a country, we believe asking for more money will change the education system. So, each year, we ask for more money. In 2007, the American public spent the equivalent of 4% of the GDP on education – about $553 billion. And, on average, between 38-60% of typical budgets are spent on “instruction.” So, how is this “instruction” money used? All the instruction materials (paper, pens, books, etc.) 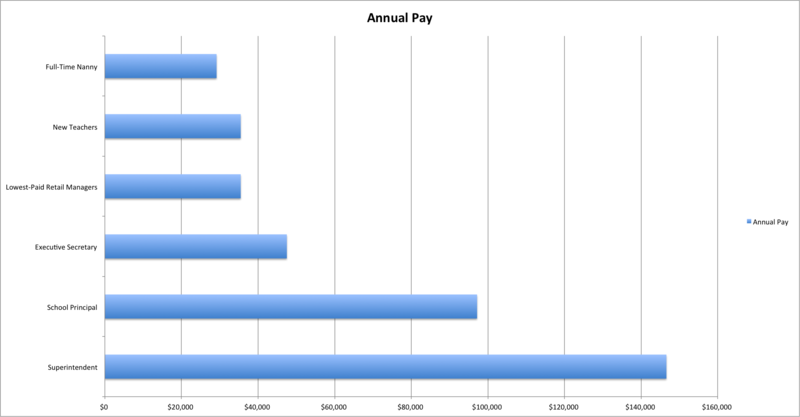 is lumped together with the cost of teacher salaries. Any expense (including $2000 video cameras, $500-per-student math programs, and science lab equipment) is included in that fee. To find out exactly how the district is spending student money, you have to find the document tucked away that gives a line-item overview. Except that there usually isn’t one. Let’s use these numbers and take a look at Texas as a prime example of dollars and cents expenditures. 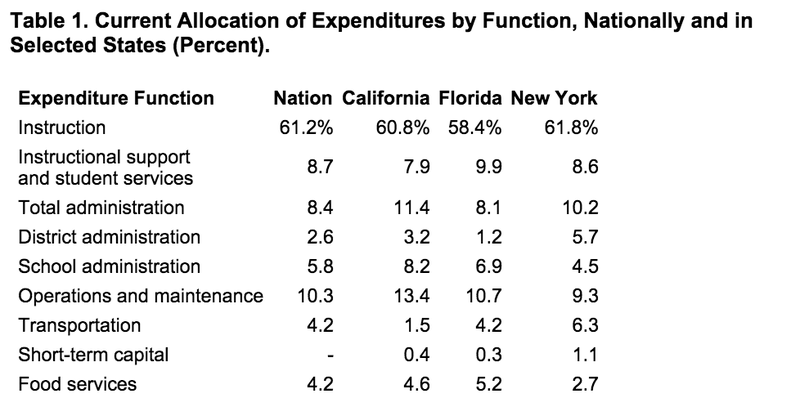 As you can see, a full 8.4% of budgets is spend on administration. For a state like Texas, that’s $4.536 billion dollars – $1.4 billion on district administration and $3.13 billion on school administration. Of course, administration is not the only place where costs can be redirected. The typical new computer-lab setup is over $50,000. Less than 1% of probationary teachers are non-renewed, meaning that bad teachers are being grandfathered into a system where they don’t really belong – potentially making the money that a very good teacher isn’t. Districts need to have more transparency on how much of their income is spent on teaching salaries and how much is spent on other instruction materials, programs, and overhead. The average wage of a Superintendent in the U.S. is $146,573. The average wage of a school principal is $97,155. 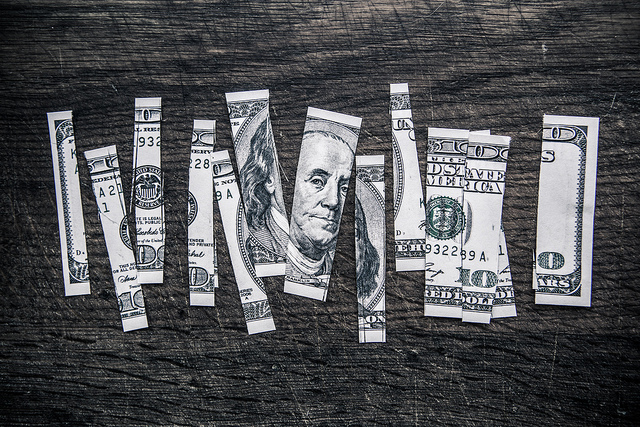 The average wage of an executive secretary is $47,500. The average wage of the lowest 10% of retail managers is $39,712. 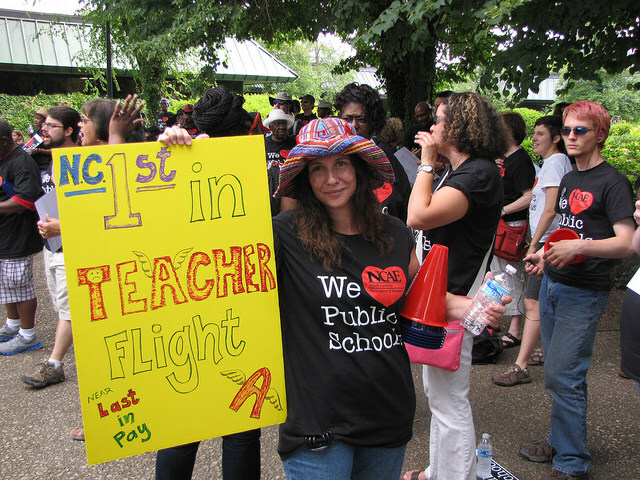 The average wage of a new teacher is $35,459. The average wage of a full-time nanny is $29,159. Why are we surprised that new teachers are falling by the wayside in the tens of thousands? We’re paying them slightly more than babysitters, and just less than Taco Bell managers. And yet we continually ask more of them – more hours, more education, more personal investment, more time outside of class, more money for school supplies…just more. Has this ideology made education better? I posit that it has not. New teachers are being required to learn and grow at an astounding pace, which leads to burnout and frustration. Not only are they pouring themselves into their job, but they are barely making their rent payment. Who wouldn’t look for a greener pasture? 1. Strong principal leadership – Principals who understand and support teacher decisions that are based on data and personal connection with the student. This includes principals who are interested and personally invested in seeing their new staff succeed. 2. 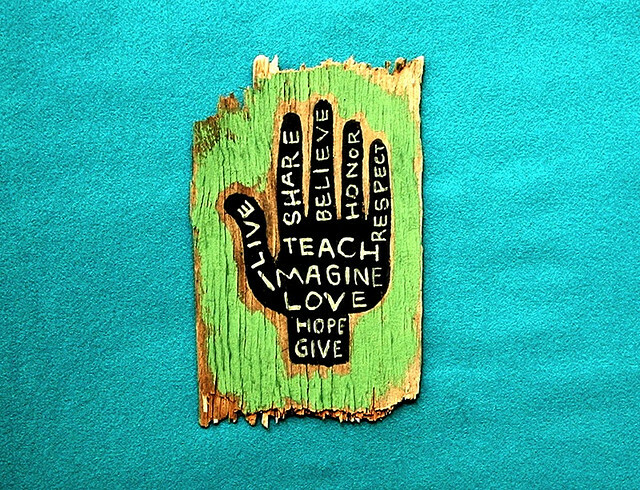 A collegial staff with a shared teaching philosophy – The right kind of staff will be an open-minded community where teachers are there to help, learn, and grow alongside students and new teachers. Dogmatic teaching styles, backbiting staff, and an inability to cooperate should be means for dismissal. 3. Adequate resources necessary to teach – Teachers should not be using their personal funds to purchase education equipment and materials, but shouldn’t be stopped from requesting specialty items. All the necessities for their job (read “necessities” not “desires”) should be easily acquired. 4. A supportive and active parent community – There is little control over this element, especially if working in a rural, urban, or high-needs area. What teachers should be encouraged to do is connect with parents and engage their help if possible. Volunteerism should be a key component of the school’s culture. Canada (7th Worldwide) – “High selectivity in teacher education programs.” Teachers devoted to 1-on-1 learning experiences with potential drop-out high school students. Finland (5th Worldwide) – “If there is a key to the success of the Finnish system, it is the quality of their teachers and the trust that the Finnish people have vested in them.” There is a systemic respect for the profession that attracts the highest-caliber candidates – only the top 10% of teacher education program graduates are accepted as teachers. Also, teachers only spend 4 hours instructing per day, with 2 hours in professional development each week. 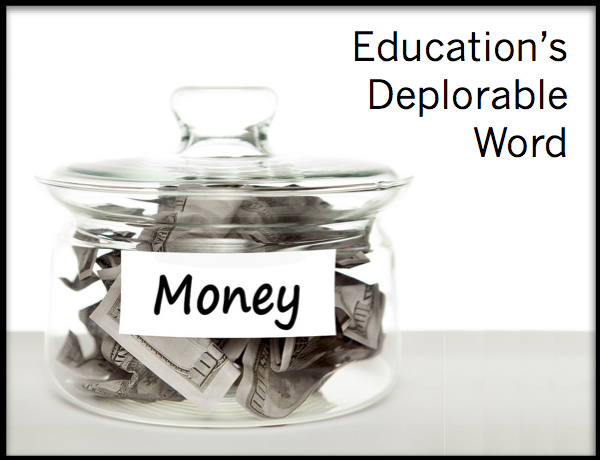 Money shouldn’t be the deplorable word in education. It should be a force that we use to the benefit of students everywhere. As we systemically change the value of the teachers’ roles in society, and begin to pay them what they’re really worth, we’ll begin to eliminate poor quality instruction and see more student achievement. What’s more, we’ll be able to finally reignite the love of teaching that so many have lost. Instead of “settling” for jobs as engineers, corporate marketing specialists, scientists, and writers, our teaching force will be able to come back to the thing that they always dreamed of doing – teaching students how to develop the skills that will change the world. I support the idea of increasing teacher salary and have been convinced for a while that a lot of the money for it could come from reprioritizing school budgets. That said, we could also get the effect of people who would be better at something else “settling” for a job as a teacher because they can’t find work in what they really want to do. I almost went back to college to become a math teacher (wound up studying information systems instead), even at the relatively low salaries teachers get. Didn’t for two reasons: one, it was a pay cut from the job I had (and still have), and two, the more I thought about it, the more I didn’t think I would like teaching. I have discovered that I really don’t like teaching; I am a teacher at church and have been training some junior employees at work, and it isn’t the most fun thing I have ever done. Sure it beats cleaning or dental work but I am kinda glad I didn’t. What would be some ways to not get people into teaching “for the money” in an environment of higher teacher salaries; i.e. not have people tough it out for 10-30 years not really enjoying what they do because it is a good payday? That’s a very interesting question. In my research, I found that the countries with the highest student achievement levels also have some of the highest teacher salaries. That being said, only the top 5-10% of students graduating from teacher programs get jobs in these countries. I think that goes a long way to eliminating those who aren’t in it to help students, especially coupled with the student-centered American teaching style. I think that people who are in teaching “for the money” (long, sustained laughter), will necessarily weed themselves out, even in a highly-paid teaching system. The competition will be so fierce (and hopefully, so student-centered) that teachers who are self-centered and money-focused will be outshone by those teachers who are creative, data-driven, and focused on the needs of the students first.